Maruti Suzuki India Limited is India's largest car manufacturer is a leader in the hatchback segment is also leading the MPV segment with its Maruti Ertiga. On the other side, General Motors is making some aggressive moves in the markets by launching back to back models. Its recent launch was the all new Chevrolet Enjoy. This is an entry level MPV that comes with better space, better seating arrangement and decent set of features. It will now compete with the most successful MPV, Maruti Ertiga. It would be tough to choose between these two models as both are offered with huge interior space, good features and offered at affordable price. In most of the aspects, both Enjoy and Ertiga are identical to each but comparing both the MPVs will help you to make out the difference. First, if we compare the prices, the all new Chevrolet Enjoy price is marginally lower than the price of Ertiga. Its base price starts at just Rs. 5.49 lakh (ex showroom price New Delhi). On the other hand, Maruti Ertiga price starts at Rs. 5.99 lakh, which is just about Rs. 50,000/- more than Enjoy. If we take a closer look at the features and specifications, Ertiga seems to have more features than Enjoy that justifies its expensive price tag. Now, let us talk about the specifications of both the vehicles. The all new Enjoy MPV is made available in both 1.4 litre petrol and 1.3 litre diesel engine options coupled with 5 speed manual transmission gearbox. Its 1.4 litre, 4 cylinder 1399cc engine makes 102Bhp of maximum power at 6000 rpm and makes a torque of 131Nm at 4400Rpm. Its 1.3 litre diesel engine produces just 77Bhp of maximum power and 188Nm of torque. On the other side the Ertiga from the fleet of Maruti Cars is also available in both petrol and diesel engine options. Its 1.4 litre petrol variant makes 94Bhp of power and 130Nm of torque while its 1.3 litre diesel engine can churn out 89Bhp of power and 200Nm of maximum torque. The features of the base version of both these vehicles are not so impressive and it would be better to place money on the top end variants. 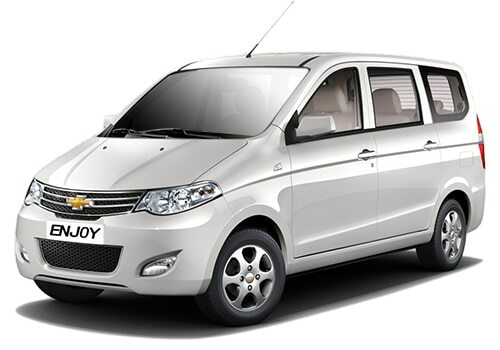 General Motors will be looking to increase the market share for Chevrolet cars in India by launching the new Enjoy MPV. However, its latest model is not as stylish as the Maruti Ertiga, which can help the Ertiga to continue its lead in the market. But still we can expect that there will be a tough competition between both these models in the coming days. If you are looking to buy an MPV with more features and more fuel efficiency and with better style then obviously, Maruti Ertiga will be the right option. Honda Amaze has been launched in petrol and diesel variants.